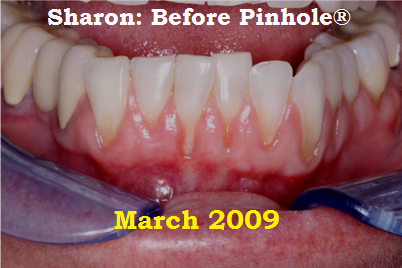 Pinhole Surgical Technique or Pinhole Gum Rejuvenation is a scalpel free, suture free, autogenous graft free treatment option to cover receding gums. This technique to cover exposed root surfaces was invented by John Chao, DDS. 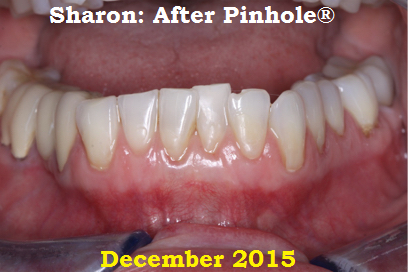 It is a minimally invasive procedure correcting gum recession and saving teeth. Through a small hole made by a needle, specially designed instruments are used to gently loosen the gum tissue and advance it over the exposed roots of the teeth. Since there is no cutting or suturing, patients can expect minimal post-operative symptoms. What is the consequence of gum recession? Gum recession is the process in which the margin of the gum tissues that protect the teeth wear away or pulls back, exposing the tooth root. When recession occurs, gaps form between the teeth and gum line making it easy for bacteria to build up and erode away at the teeth and gums. If left untreated, the supporting tissue and bone structure around the teeth can be severely damaged and may ultimately result in tooth loss. Gum recession is a common dental proble. Often, people do not know they have recession or have been informed that gum recession is easily treatable! The first sign of gum recession may be tooth sensitivity. You may also notice that your teeth look longer, or you may notice notches on your teeth. Do not ignore gum recession or exposed roots! Early detection and treatment is essential to maintaining tooth and gum health, as well as overall health! If you think your gums are receding, call us to make an appointment for an evaluation!